Orlanda and Mario’s journey was not like other people’s. You just have to read the very cool story of how they got together which they included on the front of their wedding invitations to get some idea. An unseasonally cool temperature greeted them on their wedding day and having a garden ceremony at Orlanda’s family home in the Adelaide Hills meant there was some trepidation about the heavens taking a turn for the worse. As the time for the wedding drew nearer the god’s must have been smiling from up high as the sun peeked out from behind the clouds and bathed the hills with a lovely summery glow. While Mario and his best man got ready at their place in Unley the girls were busy applying all the finishing touches in a room at the Stirling Hotel. I had never had the pleasure of shooting there before but the rooms were furnished in a beautiful style and provided an absolutely stunning backdrop for Orlanda’s preparation photos. Orlanda wore a gorgeous wedding dress from Adelaide designer Rapsimo and her bouquet was made by Adelaide Flower House. The girls complimented Orlanda beautifully in their flowing white full length gowns. As everyone gathered in the family garden the girls arrived and were greeted by one of the nicest Adelaide wedding celebrants in Alister Mitchell. I have had the pleasure of witnessing and documenting many of Alister’s weddings and again this Adelaide Hills wedding ceremony was no exception. With Orlanda’s dad walking her up the aisle the look on Mario’s face was priceless, watching his princess floating towards him. What happened next was pure gold, her dad gave the I’m watching you signal with his hands and and had everyone in stitches. It certainly lightened the mood! With vows and rings exchanged they sealed their union with a kiss. 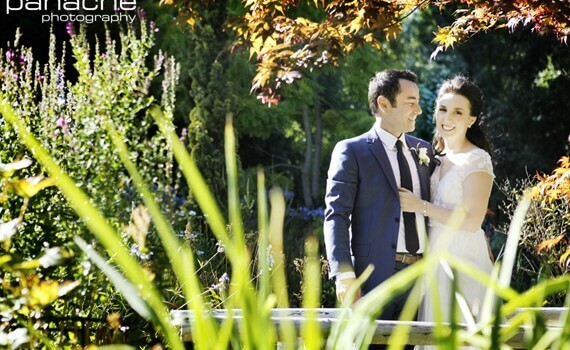 Once the paperwork was done they mingled with their family and friends in the beautiful gardens. While we took all the formal family photos the guests were treated to some scrumptious delights with the cutest little hamburgers I’ve ever seen as well as the lovely delicacy of prosciutto wrapped figs. The amazing grounds as well as the neighbouring properties provided so many gorgeous backdrops for their wedding photography. As an Adelaide wedding photographerthe hills always offers some awesome settings for photo shoots and when it is in a private garden that you would never have the opportunity to shoot in otherwise it makes it even more special. We then returned to the party which was already in full swing with the music and drinks flowing smoothly and where the largest paella dish I have ever seen was slowly simmering away. As the sun set on an amazing day everyone proceeded to dance into the night and Orlanda and Mario enjoyed their first evening as husband and wife!